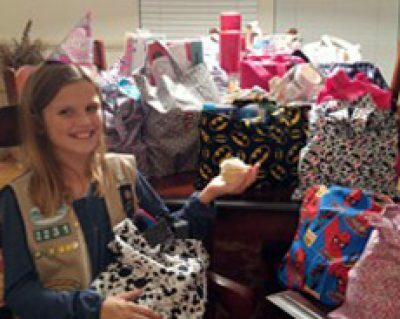 Our thanks to Lexi Kertscher, a local Girl Scout Junior Cadette who designed and sewed 42 birthday bags to be given to Haymarket Regional Food Pantry clients. Lexi purchased the materials, sewed the bags herself, and filled them with items that you would use for a birthday party. What a wonderful surprise for all! Thanks, Lexi for spreading birthday joy with our HRFP families.